Loaded with charm, the Crow's Nest is a real treat. Located in Port Angeles with dynamic views in all directions. From the Coast Guard Station to Mt. Baker, the view is nothing short of stupendous. You will see everything the shipping lane has to offer. The living area features comfy furnishings with sofa and oversized chair and ottoman, perfect for curling up with a good book and cup of tea and gazing out the large picture windows at the view below, the perfect mixture for rest and relaxation. With its bright kitchen, you can fix a fabulous meal or a delightful snack. Great dining table overlooking the harbor seats up to 6 guests. The Master bedroom with queen bed is located downstairs. The charming upstairs bedroom has a double bed and chaise lounge with wrap around windows that have the best view in the home. At the top of the stairs is also a "room" on the landing with a twin trundle bed perfect for additional guests. The view from the gazebo is a great place to enjoy your evening glass of wine or your morning coffee. A propane BBQ is provided for grilling on the back patio with additional outdoor seating. Port Angeles offers a dynamic waterfront and downtown shops with a wonderful variety of restaurants, all within a couple minutes drive. Take an evening stroll, or a long bike ride on the Olympic Discovery Trail just a mile away from the home. Take a day trip to Victoria, BC, a Victorian city with wonderful shops, museums and restaurants by taking the Coho Ferry Line right from downtown Port Angeles. Want to see some whales? Port Angeles Whale Watch Company guarantees whale sightings May 9th to November. Located close to the entrance of Hurricane Ridge, bring along your camera and binoculars for taking in this magnificent view. Venture farther west into the Park and discover more breathtaking hikes at Marymere Falls, Lake Crescent, Sol Duc Falls and the magical Hoh Rainforest. With so much to do and see, the Crow's Nest offers a comfortable and relaxing home base to come back to. However, you might just find that you'll never want to leave this wonderful retreat! ***Please note that the nightly rates on this property are based on 4 guests; there is an additional nightly guest charge per person up to 6 guests max. Children over the age of 10 years old only. They were very nice and professional. You guys were great to work with, from the online process to meeting the folks in the office. That view! The cottage is very cozy, a little dated, and small, but that view is something. We don't look for luxury, we like functional and location. The Crows Nest exceeded this. Everything was perfect: The location, the accommodations, the backyard/garden, and the features and provisions of the cottage. The view was fantastic out the picture windows. We rented the Crows Nest for four nights, and now wish we had rented it for a week. 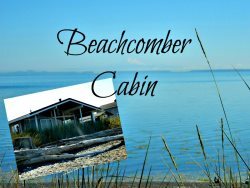 It is an absolutely pristine little home with the most fantastic view of the Straight of Juan De Fuca . You can watch cruise ships, cargo ships, and fishing boats travel right outside your back yard. You also can see Vancouver Island and Victoria across the Strait .It probably has the best view in Port Angeles. It also has all the amenities you need to feel at home. Will definitely be staying here again. The house is very comfortable in a nice quiet neighborhood. Very well kept and decorated and extremely well furnished and stocked. The view was beyond outstanding. When it was clear, you could see Victoria BC north across the strait and even Mount Baker way off near the Washington / Canadian border! Plus the constant flow of traffic on the strait: tankers, container ships, cruise ships and all sorts of other boats. For me (coming from landlocked Austin) there was never a dull moment looking out the picture windows in the back. We toured the area while we were there (whale watching, Olympic National Park) and enjoyed the town (good restaurants, good beer, great seafood). Port Angeles is a very cool town to hang out in. And it was always nice to go back to our quiet little hideaway for some rest. This was a great option for us for our shipyard trip. We stayed for a month and a week. Love the view and watching the shipping. Thank you very much, F/V Intruder Crew. The Crow's Nest is an absolutely charming seaside cottage! Thank you so much for all your loving attention to detail!! We thoroughly enjoyed our stay here while on the peninsula to visit family in Sequim. Your gracious hospitality is on display inside and out, and we are just so thankful for the opportunity to have enjoyed this special place. ***Please note that the nightly rates on this property are based on 4 guests; there is an additional nightly guest charge per person up to 6 guests max. Child Restriction: Children over the age of 10 years only at this home.